Center For Advanced Medicine - Boone Hospital Center - PWArchitects, Inc.
PWA worked with the design firm of ACI-Boland on the four-story, 80,000 square foot Center for Advanced Medicine addition to the south of the existing Boone Hospital Center. 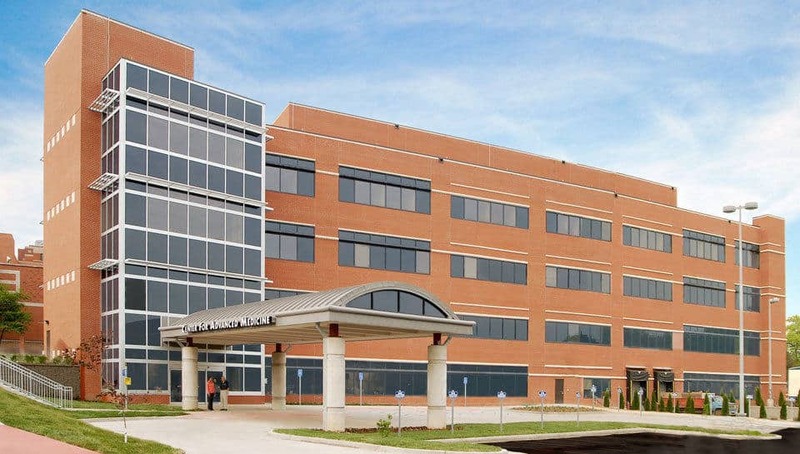 The Center for Advanced Medicine houses five new operating rooms, an addition to Pre/Post Op, four Cath labs, sixteen short stay rooms, the Harris Breast Center, GI facilities, Central Sterilization and Supply, a conference center and additional offices. Incorporating many of the existing functions of the current hospital required careful coordination to properly connect and reorganize the existing spaces. Corridors and rooms were relocated, elevators were reworked to add openings and structure was planned to span and support the existing building. Another challenging facet to this project was that it is a story taller than the existing building. Flashing, structural supports, and details were selected for their constructability and cohesiveness with the existing structure.